You might only know her from being a spearhead when it comes to haute couture: Jill Sanders has been in the fashion game since the nineteen sixties, however, her output and oeuvre has had a lasting impact on the design of products, perfumes and bodycare product, the advertisement industry and even architectural endeavours. 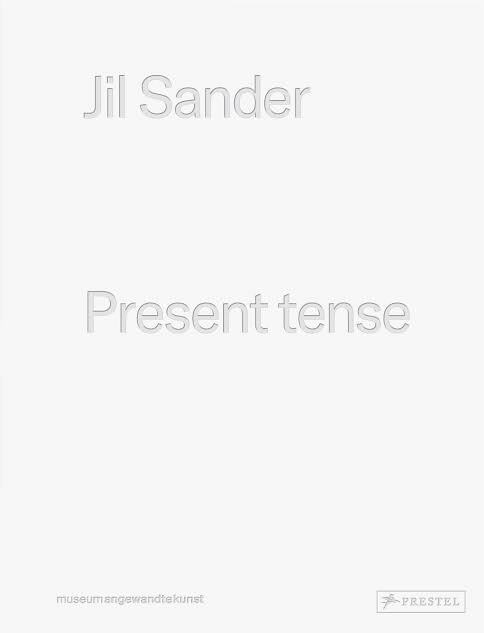 Present Tense is based around Jill Sanders’ solo exhibition, which was meant to both pay homage to her legacy as well as provide an extension of her aesthetic vision, which has often been defined as rigorous in style and rather subdued when it comes to colourful explorations. It is interesting to see reminiscences to the hybrid approach of marrying industrial production with craftmanship and accessibility that the Bauhaus movement has become known for along with reflections on what the Teutonic era of classicism brought to the fore, specifically the notions of purism that inspired her photographic works that more often than not puts the material at the centre of attention – the lion’s share of which has been sourced from remote locations. Her on-going questioning of modernism versus practicality, minimalism versus luxury and the theme of “fashion for fashion’s sake” versus simplicity pervades Present Tense. Needless to say that the book design in itself is a main selling point and the accompanying essays by Matthias Wagner and Jasmin allow further insight that enhance the experience of the documentation of the constants of Jill Sanders’ sophisticated, self-assured career – a career that relied neither on provocation nor on nostalgia.